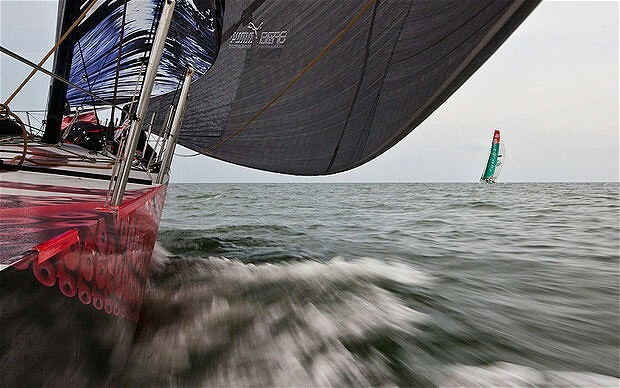 American team Puma survived a collision with a tree trunk to move into a three-way battle for the lead on Sunday as the Volvo Ocean Race fleet picked a precarious route through the Malacca Strait. With over 1 500 nautical miles (2 800 km) sailed in the second stage of Leg 3 from the Maldives to Sanya in China, just a handful of boat lengths separated overall leaders Telefonica of Spain, French challengers Groupama and Puma. All three were in sight of each other at 1:100 GMT on Sunday, as they tried to steer a path through the hundreds of commercial ships and fishing boats in the narrow Strait, as well as hunks of floating debris. Puma have had the biggest scare so far after a shuddering collision left them with damage to part of the boat but crucially left the rudder intact. "There’s ships everywhere, debris everywhere, as we found when we hit a tree," Puma skipper Ken Read reported. "There was this bang and we crunched up a dagger board, taking a chunk out. It probably saved us, though, because the tree could have wiped out the rudder." Spanish/New Zealand team Camper, who are Telefonica’s closest challengers overall in the 39 000 nm (72 000 km) round the world race, are stuck in the second group of boats after misjudging the breeze. They are around 50 miles behind along with Abu Dhabi. Team Sanya are trailing way back in sixth with little hope of reaching their home port in anything other than last place. The leaders have around 200 miles to sail to get out of the Strait and head into a long closing stretch through the South China Sea to Sanya. Their estimated time of arrival in China is around February 5-6. Overall standings: 1. Telefonica (Spain) 71 points; 2. Camper (Spain/New Zealand) 64; 3. Groupama (France) 51; 4. Puma (U.S.) 36; 5. Abu Dhabi (U.A.E.) 31; 6. Sanya (China) 11.